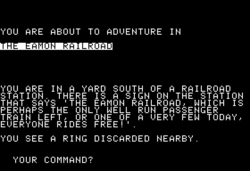 The Eamon Railroad is an Eamon adventure written by Sam. The Eamon Railroad is one of five adventures attributed to "Sam." All five adventures were announced in the August 1985 issue of the Eamon Adventurer's Log and attributed to "?." The Eamon Railroad has no introductory text, story, or objective. The "goal" of the adventure is simply to explore the various stops aboard the railroad, which is alternately called the "Apple Express" or the "Eamon Express." The conceit of the adventure is a train that can be operated by the adventurer by saying the name of the stop to which he or she wishes to travel. While there are a handful of monsters and some treasure to collect, the upshot of The Eamon Railroad is essentially limited to examining the various settings created by Sam. The praise found in Tom Zuchowski's review of The Eamon Railroad was limited to the execution of the novel idea of traveling by train. Beyond that, Zuchowski dismissed the adventure, giving it a rating of 2 out of 10—making the adventure one of the worst-reviewed Eamon adventures in existence. The review compared the fun of playing the adventure with "[t]he excitement of hanging out at any old train station." Sam's original Apple II adventure has five locations: Eamon (altered in the Eamon Deluxe version to the name of "Madison"), Flagstop, Mudville, Dodge, and the Main Hall. Though a "flag stop" is traditionally a generic term for a stop on public transportation lacking enough traffic to warrant stopping without a passenger requesting a stop, the adventure names the station itself "Flagstop." This—and the small museum at the station itself—suggest that Flagstop is indeed the name of a settlement. Of all the stations described in the adventure, only the setting of Dodge is fully developed. (Apart from the necessary train platform in each, Flagstop features only a train museum, Mudville, a fortuneteller's shack, and Eamon/Madison a small cafe.) Dodge features a "western" theme, complete with a saloon, a just-robbed bank, and revolver-carrying gunfighters. No clues are given as to the physical locations of any of these areas beyond a generic message that each station requires a commute of a "few hours." The geography described in the adventure A Runcible Cargo, which makes extensive use of the Eamon Railroad, however places Dodge to the east of the Main Hall (or "Evenhold," as Pat Hurst would have it) and Mudville to the east of Dodge and all three settlements on the northern coast of the Malphigian Sea. The "train" theme is reflected heavily in the artifacts found in the adventure. Some of the loot accessible to the player are a railroad stock certificate, a train schedule, and two model trains. The Power spell always teleports the adventurer back to the train at the nearest platform. The EAMON.DESC file contains an unused effect suggesting that the adventurer could say TEACH in order to exchange 500 gold pieces for increased spell abilities; this option is not employed in the MAIN PGM, however. This page was last edited on 24 February 2018, at 07:29.